With the G432 gaming headset, be surrounded by the game environment. Get the thrill of being fully immersed in the action and always heard for a complete gaming experience. Big 50 mm audio drivers produce a complete, expansive sound for a more immersive gaming experience. 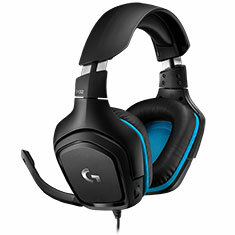 Next-gen DTS Headphone:X 2.0 surround sound,DTS Headphone:X 2.0 surround sound requires Logitech G HUB gaming software. powered by Logitech G HUB software, lets you hear enemies sneaking behind you, special ability cues, and immersive environments—all around you.